There’s a realization that every freelance designer must go through at some point: client work isn’t enough to ensure your long-term financial security. What if you get sick? What if you can’t find clients? What if you want to take a vacation? One possible answer to this problem is earning passive income — i.e. selling products or services instead of selling your own time. A common way to do this is to sell digital goods such as eBooks, PSD templates, WordPress themes, icons, and so on. But how exactly should you sell them? Although there are lots of marketplaces for selling digital goods, they often take a big cut of the profits. What’s more, they don’t let you customize the sales page, or let you use your own brand. This is where digital goods services come in. These services only take care of the payment, file storage, and download, and let you do the rest. This means you can easily sell your products from your own website, or through social networks. I recently wrote an eBook about UI design and needed to find a way to sell it, so I compared five such services: Quixly, FetchApp, Pulley, E-junkie, and Gumroad. I’ll tell you which one I picked at the end… but in the meantime, here are the results of my research. Alice pays for your product with Paypal, Google Checkout, etc. Let’s take a moment to look at that second step. Most digital goods services do not deal with the big credit card companies directly, but instead go through payment processors such as Paypal or Google Checkout. This means that you need to take into account the additional fees charged by these companies (the standard fee for both service is a 2.9% charge plus a $0.30 fixed fee per transaction). 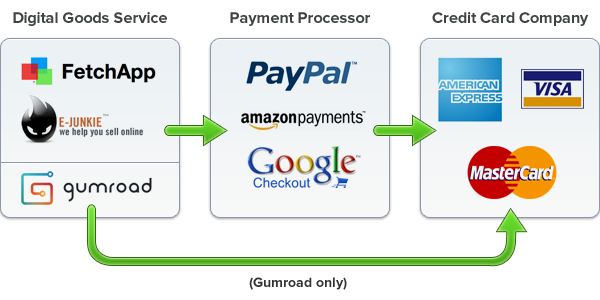 The only service which does notgo through a payment processor is Gumroad, meaning it lets customers pay right there on Gumroad. Now that we have a basic understanding of how things work, let’s take a look at each service. Quixly is the brainchild of the tireless Drew Wilson, who’s also the man behind BuildItWith.me, Pictos, and many other projects. 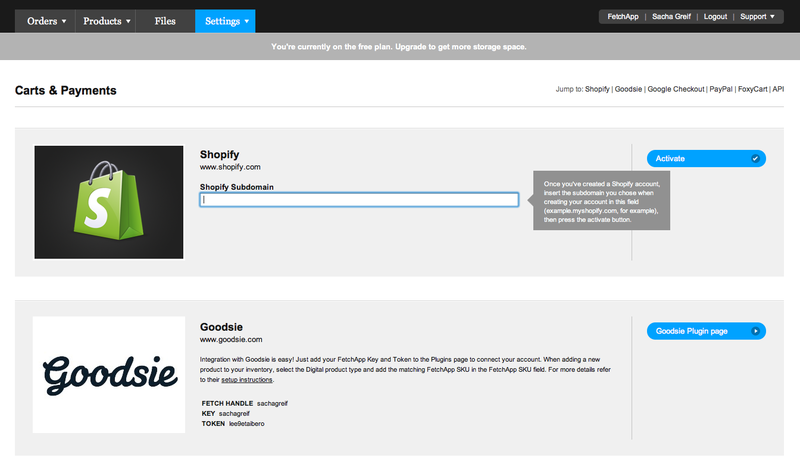 FetchApp was originally — and still is — a Shopify app (in fact, the first ever!) but has since taken a life of its own. According to FetchApp’s Mike Larkin, it’s “simple enough to be used to sell a single product, but large enough to also accommodate record labels selling hundreds of tracks”. 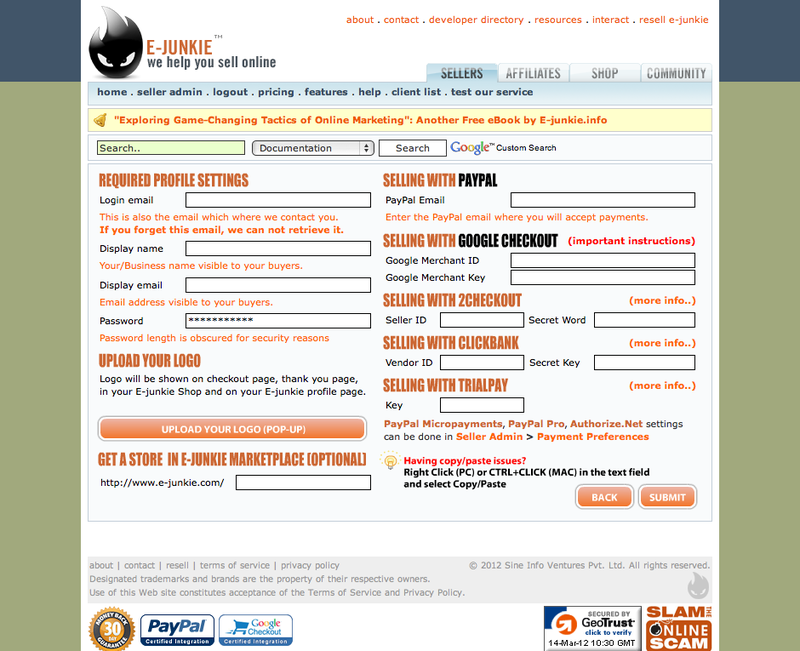 Pulley is an offshoot of BigCartel; a hosted shopping cart system similar to Shopify. E-junkie has been around for quite a while, and it shows in its homepage and dashboard’s design. But it’s also the most full-featured service by far. 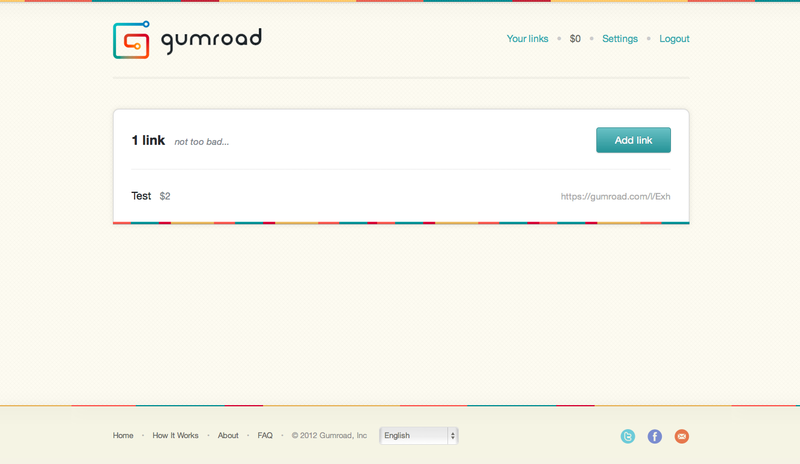 Gumroad is a relative newcomer in this field, but has been generating a lot of buzz. Unlike the other systems, it doesn’t have a monthly fee, and instead charges a fixed cost plus a percentage on each transaction. This is a strong argument in Gumroad’s favor, since having to deal with less intermediaries is always better. And this means Gumroad works even in countries where Paypal isn’t available, such as Serbia or Pakistan. Of course, there are a lot of other options, such as Payloadz, Digital Delivery, and one of Paypal’s many confusing services. But I decided to focus on these five because they seem to be the most commonly used among Web designers. Hopefully this article will give you the tools to evaluate other options by yourself if you need to. FetchApp, Pulley, Quixly, and E-junkie all work the same way — they have pricing tiers corresponding to file sizes (and sometimes the total number of files you’re selling), but all have unlimited bandwidth. Note that Quixly has relatively cheaper pricing tiers (free, $10 / month, and $30 / month), but charges $0.40 extra per GB of bandwidth when over the limit for each tier. On top of this, all four services require a payment processor, which charges its own fee (usually 2.9% + $0.30). On the other hand, Gumroad’s pricing model is completely different. Instead of charging a fixed monthly fee, Gumroad takes a fixed fee ($0.30) plus a percentage (5%) for each sale. It’s important to point out that Gumroad does not charge Paypal’s 2.9%, even when it’s time to transfer your earnings to your Paypal account. For this comparison, I’ll imagine three use cases and then see which service works best for each of them. Let’s say we’re selling a short eBook for $10. The file is pretty light, let’s say 9MB, and we sell 100 a month, using up 900MB of bandwidth, earning a total of $1000. 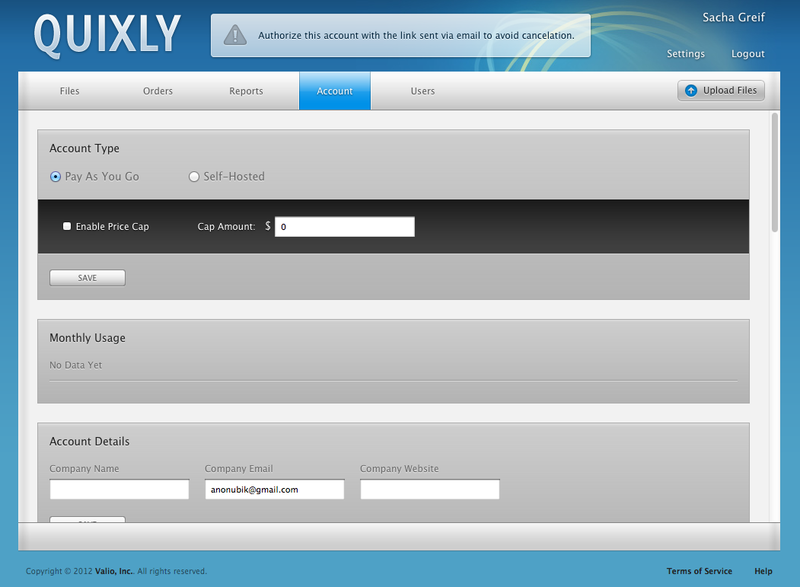 Quixly is the cheapest option, since we’re within the limits of its free plan. Although FetchApp also has a free plan, it’s only for files up to 1MB. So for small files, Quixly comes out ahead unless you really plan to use up a ton of bandwidth. And what about Gumroad? Well, since they charge you extra for each sale, it doesn’t make sense to use them in this case unless you know you’re only going to sell your product a couple of times. Our WordPress theme comes with all the PSD sources and a lot of documentation, so it weighs in at 70MB. We sell 50 per month for $30, coming up at 3.5GB of bandwidth per month and $1500 of revenue. For our second use case, Pulley is the best option, thanks to their entry plan that goes up to 100MB in storage. That being said, for a couple of megs (more or less) another service might reveal itself cheaper. So I’d say the mid-size files category has no clear winner — but Quixly, FetchApp, and Pulley are all safe bets. Our video is high-def, 1080p goodness and it’s a whopping 4GB. We expect to sell 10 per month at $50, so that’s 40GB of monthly bandwidth and we’ll earn $500. The clear winner here is Gumroad, since it doesn’t care about bandwidth or file size. For files that you only expect to sell a couple of times, it can be a very interesting model, especially if those files are big and you sell them for a low price. Quixly is also an attractive option, but if you’re dealing with big files, watch out for Quixly’s extra bandwidth costs! Let’s say instead of selling 10 videos, we sell 100, putting our bandwidth at 400GB. That’s 400-60=340GB over the limit, which will cost us 340*0.4=$136 extra! Thankfully, Quixly will warn you before you reach that limit, which will give you the time to switch to another provider. Still, if you expect to have big bandwidth costs, you might be better off choosing another service from the start. Marketplaces, like ThemeForest or the other Envato websites, are also a great way to sell digital goods, and should be seriously considered. Sure, you give up a big chunk of your earnings (one usually keeps between 50% and 70% of each sale). But on the other hand, a lot more people will see your product and buy it. And don’t forget you can also sell your stuff non-exclusively (i.e. in addition to one of the services we’ve already discussed), although be warned that if you choose to go that route, you’ll get an even lower cut of the profits (only 33% on Envato websites). I would say that marketplaces are a good fit for people who would prefer not to take care of their product’s marketing, or are selling a lot of similar items. They also make more sense for certain items (like WordPress themes, or stock photography) than others. Another solution is hosting the whole thing yourself. For example, WordPress users can get the free WooCommerce pluginto set up a shopping cart and then hook it up to Paypal or many other payment processors. While this approach is cheaper in the long run, it does take a lot more time to set up, and requires more technical skills (so it’s not for everybody). But if you’re trying to build a business out of selling digital goods, it can be a very interesting option. You might be wondering which service I picked for myself. 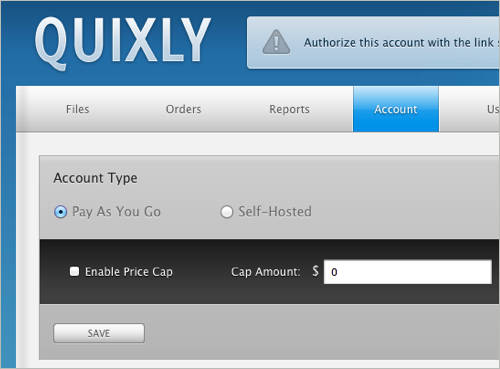 I hesitated between Quixly, Pulley, and FetchApp because they all looked great, but in the end Quixly’s beautiful user interface and detailed reports won me over. After using it for a few days, I have to say the visual reports, although not a core feature, are a very nice touch to see how your sales are doing. But I did get a sizable number of people who encountered problems with Paypal, or didn’t buy altogether because they didn’t have a Paypal account. So I’ve decided to let people choose for themselves between Gumroad (if they want to pay by Credit Card) or Quixly (if they want to pay via Paypal). The great thing is that since Gumroad doesn’t charge a subscription, there’s no extra costs in adding it as a second service. And I will probably give FetchApp and Pulley a try soon as well to compare them with Quixly. The great things with having so many options is that everybody can find the one that suits them the best. So I encourage you to try out and compare these services for yourself! Let user pick their own preferred way of paying: Even though most services support multiple ways of paying, the seller can only pick one at a time. I would love to see an intermediary step that lets users choose their own favorite payment method. Improve stats and reporting: I would love to see reports generalized across every product, as well as more advanced features like filtering, export, etc. Discount code support: When marketing an online product, you need every tool in the arsenal! No fixed fees: Paying a fixed $0.30 fee on every transaction is a killer when you’re selling something for under $5. I’m definitely going to keep an eye on all five services to see what they come up with. In the meantime, I hope this guide has been useful to you, and that you’re now ready to start making money!